When I was told that this upcoming issue was going to be “Surf” themed, I knew the perfect board to showcase. Last year, Kal Koncepts/Air Syndicate Inc. cranked out quite a few painted goodies for the 2007 SEMA show. The theme in the House of Kolor booth was “Surf’s up”. We painted up a Ford Project Edge as a woodie themed vehicle, with kustomized surfboards, and motorized surf-racks. While that was the feature vehicle of the show, the real show-case of art were the individual surfboards. 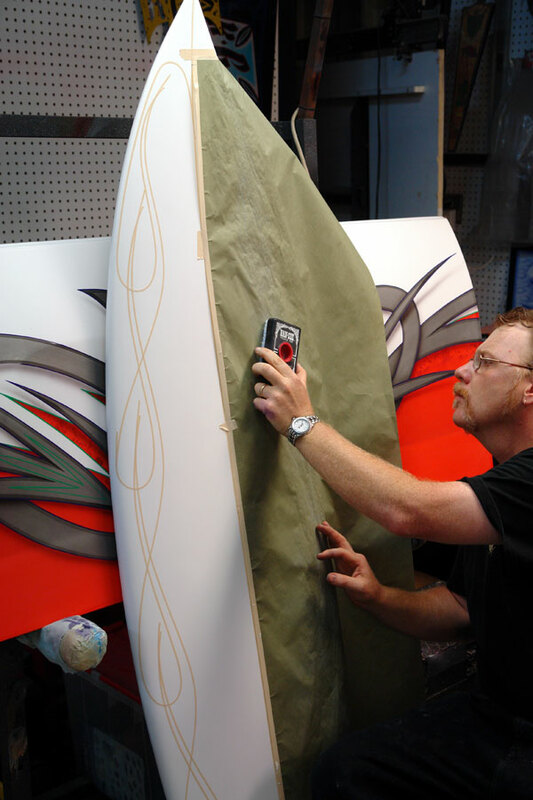 House of Kolor commissioned Tim Phares of “Epic” Surboards to kustom shape 11 boards for the HoK booth. 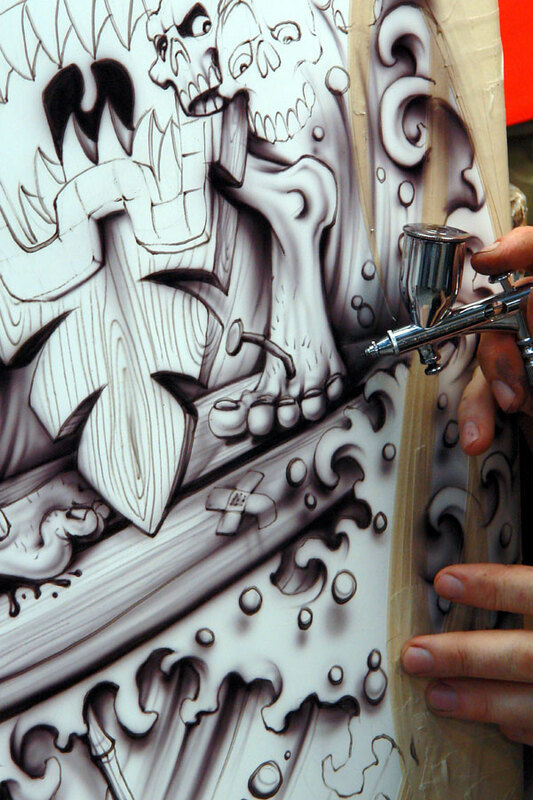 These boards were then given to 11 separate artists, to create mini-masterpieces on. The board they gave to me is the one that this article is based on. First off, there are 2 different ways to approach painting a surf board. There is the traditional way that board builders apply the art, and that is to the raw, carved foam core, before the glass I applied. This is usually difficult, since you cannot use materials that will react with the foam, or run when the glass is applied. (This pretty much eliminates most urethanes, lacquers, and enamels. Leaving us with tempura, waterbased acrylics, and some marker pens). Oh yea. Crayons are kewl. While this is definitely a challenge, it is not the best way to approach the subject for art display pieces. Hence, we will be using the second approach. Basically treating it like any other kustom paint job coming into the shop. Sand the board with 220, primer with HoK DTM, basecoat, clear, sand, and apply graphics. Now you may be wondering why I don’t just sand the glass with 600, add the artwork and graphics, and clear. Well, basically this would work, if not for the many inclusions that tend to be in the final glass coats of boards. (Especially the flat finished ones). These inclusions may appear harmless when basecoating, but can quickly turn into terminal fisheyes when the final urethane clearcoat is applied. A simple primer coat, with basecoat white, and clear will just take a little of your initial time, but give you a much better foundation for your artwork. Did we paint the entire board? No, I chose to wrap my artwork around the rails, and mask off the bottom of the board. Any small edge can be buffed out later, and covered with a pinstripe. Normally, I would only paint the underside of a board, if it was going to be seriously ridden. Why? The wax usually covers all the artwork, and looks like crap. Occasionally I will do rail designs, or simple graphics like flames on the top, but detailed murals are lost on the actual deck. These boards are for display only, and the way that the board stands hold them, the top deck is the best location for the artwork. The backside still has the Epic logo, Tim Phares Signature, and a kewl House of Kolor logo laminated under the glass by Tim. Well with that intro out of the way, let’s paint a surfboard! 1. After Dion prepped, primed, based, and cleared the board, all I had to do was sand with 600, and start laying out graphics. The main graphic on my board will be a rail design of tribal flames weaving all along the sides of the board. This will leave the center open for the mural work. I lay out the flames using plain 1/8” tan 3M crepe tape. 2. Since both sides of the board can easily be seen at once, I want the designs to be perfectly symmetrical. This requires a little tracing, and pouncing the design. I use s single sheet of masking paper, and construction crayon to trace the image that I will duplicate in reverse on the other side. 3. With the design transferred, I go ahead and add the tribals to the pattern, and then proceed to fill the masked design with ¾” crepe tape. For larger areas masking paper can be used, but we are talking small areas here. 4. Time for the fun part. The muralwork. I initially sketched out the freeform mural lightly with a pencil. I then come in with my BC-25 basecoat black, and Iwata Kustom Eclipse. When the entire design is sketched in with the airbrush, KC-10 precleaner is then used to wipe off the excess pencil marks. 5. With this up-close shot, you can see how I come in and start shading, and shadowing with my black. Unlike the pure BC-25 black that I used for the linework sketch, I mix up a batch of transparent black using a mix of BC-25, SG-100 intercoat clear, KK-04 oriental blue, and KK-15 violet. 7. Thought you would like a pic of the board being unmasked, before we cover it all up again. It was important to fog my transparent black all along the taped edges early on. Otherwise, the negative flames would not show up when unmasked. 8. After the board is unmasked, it is checked out for any touch ups, then the mural is bac-kmasked, so that some color could be sprayed on the flames. I want to take advantage of the white base, so I use some glycerined water and a spray-bottle to create an acid washed effect when the basecoat is sprayed. 9. The wipe shows you the effect. I don’t want the water, and paint to sit too long on the board, or it can give you a rough look. You also do not want to wipe the surface too soon, or you can pull the still wet basecoat. Takes a little practice to get it right, but not too difficult. 10. I wanted a little more textural effect in the flames, so along the rails I utilized my old friend, the Whisk broom stencil. Basically it is just a bunch of broom straws that are randomly taped together. 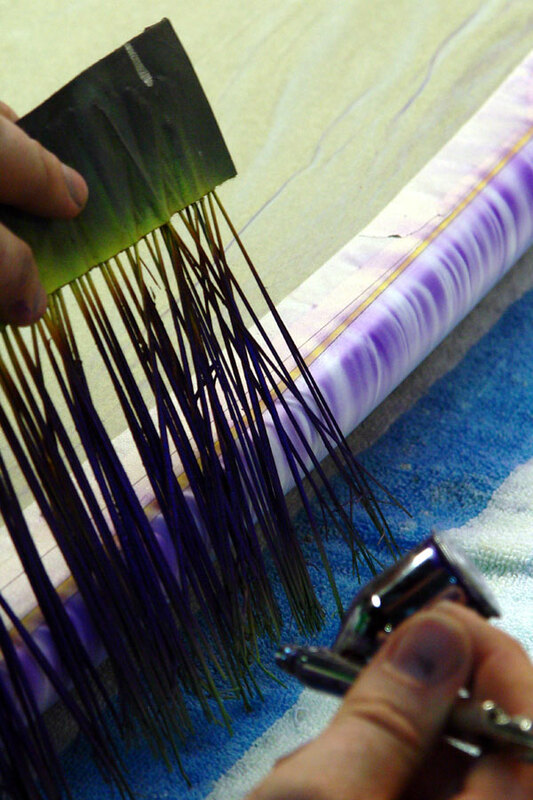 Gives a killer effect on any graphic, especially if you want to create a Tie-dye look on a surface. 11. Hey, it is “Pinstriping, & Kustom Graphics” Got to put a little striping in the article! Hehehh. Just a little lime green, and Lavendar HoK striping urethane, applied with my Mac #10, and we are in business. Not only does it finish off the flames, but the Von Dutch touch ties all the murals in with the rest of the board. 12. Time for the clearcoat. After remasking the entire back of the board, (So that the clear will wrap the original taped edge, thus rounding the edge, and making it easily to stripe, and less likely to delaminate). Dion sprays the entire board with 4 wet coats of UFC-35 HoK clear, using his trusty LPH-400 1.5 Iwata spraygun. Finish Title Shots: There ya go. One kustom painted surfboard ready for the SEMA show. 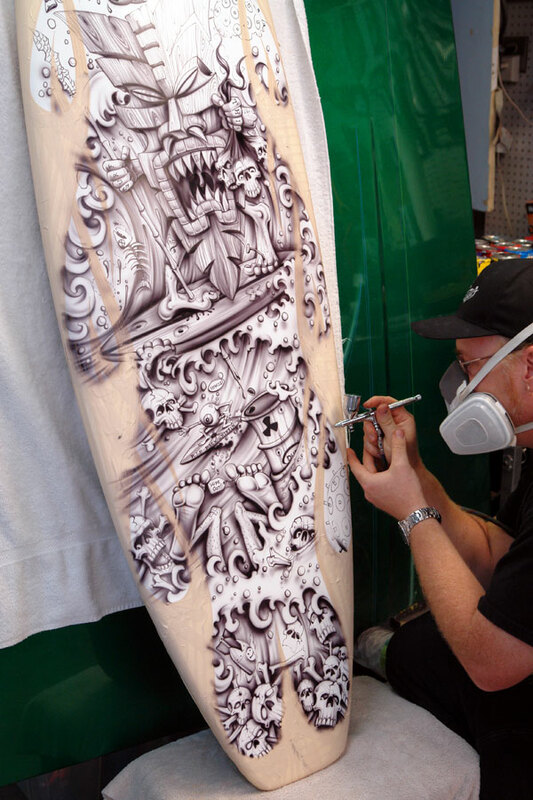 House of Kolor wanted each of the artists to paint their boards best to represent themselves, and their favorite styles. I wanted my board to be a combination of three distinct kustom styles. Masked/airbrushed graphics, Freehand muralwork, and pinstriping. The triple threat of kustom painting. You will notice that the majority of work that I create at Kal Koncepts/Air Syndicate incorporates these three techniques, so I wanted my board to best represent that. I highly encourage any kustom painter to try painting up a surfboard. Not only is it a great attention getter at car shows, but they also look killer on your wall. (Definitely get a new one,..you don’t even want to try and get all of the old surf wax off a used board,…it is not remotely fun!) Heck if you can’t find a good board, just paint up a few skateboards, or some of the longer sidewalk surf boards. All are a blast to paint, and look great in your portfolio.